As a frequent traveler I am used to going in and out of cities without getting too attached to them. However, Berlin was different for me. It was a city that I could see myself living in. Perhaps it was the young, Bohemian feel or the variety of excellent restaurants, or, maybe, how its fascinating history shaped the city today. Either way, I believe that Berlin is a metropolis that everyone should visit at least once in their life - even if it is only for a few days. Today I’m going to share with you my recommended guide for visiting this colorful German city. Arrive in Berlin, refreshed and ready to start exploring. When I arrived I was coming from Munich, where I had spent the last couple days learning about the ancient Bavarian city. To me arriving in Berlin from Munich was similar to landing in another country. It was about as different as New York City is from Upstate, New York. For my guide on Munich, click here. For luxury at it’s finest, we checked into the beautiful, and historic, Hotel Adlon Kempinski. This hotel is as luxurious as it is filled with fascinating history. In the 1920’s, it was one of the most famous hotels in all of Europe and frequently visited by celebrities such as Albert Einstein, Josephine Baker, Charlie Chaplin, Franklin Roosevelt, and many others. It was also the famous hotel where Michael Jackson later held his child Blanket out of the window! Though the history is interesting, it is also a great location. It is located on Unter den Linden, the main boulevard in the central Mitte district, at the corner with Pariser Platz, directly opposite the Brandenburg Gate and the Memorial to the Murdered Jews of Europe. From my room I could see the beautiful gate each morning out the window. It was absolutely lovely! I have always believed that food is what teaches you the most about a country, which is why I booked a tour with with Henrik Tidefjärd from Berlin Agenten to give me a local food and nightlife tour of the area. Henrik is a character in himself. Originally from Sweden, he has lived in Berlin for over twenty years and knows the culinary and nightlife scene as well as the best chefs and partiers in the area. We hopped between gourmet restaurant, to mom-and-pop shop, to craft cocktail bar, and even a unique dessert bar called CODA. I can’t give you all the details of where we went because that would give away Henriks whole tour! But know that it was one of the best food tours I’ve ever been on. Henrik has given tours to celebrities, like Madonna, so he knows how to entertain your mind and tastebuds. The next day we explored the city by bike with Berlin on Bike. Seeing any city by bike is the best way to learn about it’s layout and get an idea of what places you would like to visit more extensively. 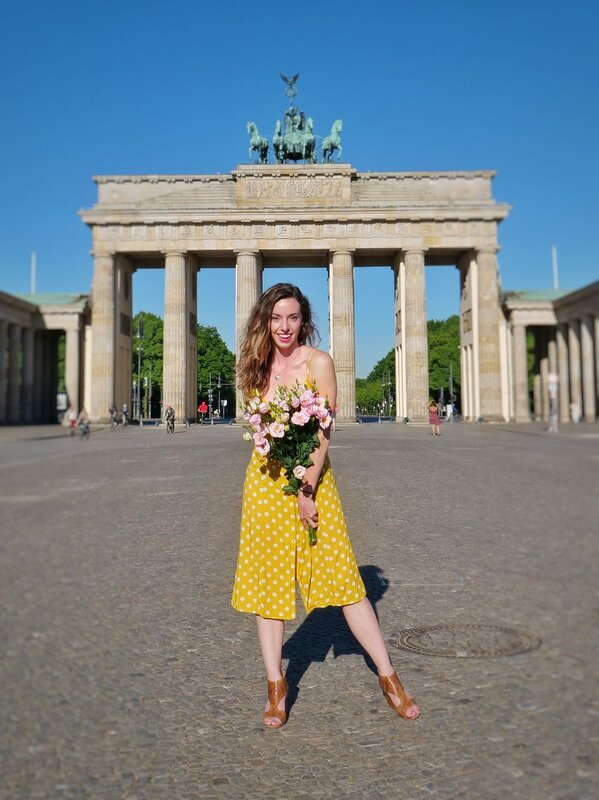 During the tour we discovered Berlin’s vibrant street art, the remnants of the wall, green and sustainable urban gardening ideas, and, even, enjoyed a beer in a local beer garden. For lunch, we went to Café Botanico. A quaint locally owned restaurant that grows all of the ingredients they use in their garden. This was some of the best food I had in the country simply because it was so flavorful. I imagine it is because the ingredients were so fresh! The gardener was tending to the garden when we arrived and welcomed us with a brief tour. This restaurant is a great example of how locally sourced ingredients can dramatically enhance a meal. After lunch the bike tour continued for a few hours. We stopped by what was once an old airport landing strip and now turned into massive public park. I thought it was so creative to turn the space into a useable area for the community. As we biked on the old landing strip we passed barbecues, birthday parties, and kids learning how to ride a bike for the first time. It was so sweet. For dinner, we went to Clärchens Ballroom. Founded in 1913 by Fritz Bühler and his wife Clara, affectionately known as Clärchen, this two-story ballroom has an air of gracefully faded grandeur. Today you can step inside for a schnitzel or to learn a variety of dance. However, this spot was not always as lovely as is now. This hall has witnessed wild 1920s nightlife, sword duels, allied bombing, balls for war widows and, more recently, a dramatic revival in 2005. Now they hold regular concerts, and are considered one of the trendiest spots for twenty somethings. On our last day in Berlin, we booked an art, architecture and lifestyle tour through Mitte with GoArt! On it we visited galleries, learned about Berlin’s new cultural heart and meet local fashion entrepreneurs in their showrooms. For dinner, we went to TISK. One of the cool things about TISK is their open kitchen setting, where you can see the chefs preparing your food right in front of you. Here they serve a combination of modern and traditional German cuisine paired with classic Berlin style bar. The kitchen is run by Martin Muller, who has nearly 20 years of experience in the restaurant industry. He even worked under Tim Raue as a sous chef. Martin specializes in pairing food with craft beer so I recommend ordering that when you come to TISK. And suddenly, my trip to Berlin had come to an end. Though I knew I would be back soon, if not to live there, at least for a short visit. It was a city that surprised and delighted me in ways that I didn’t ever expect. Watch my germany video series!